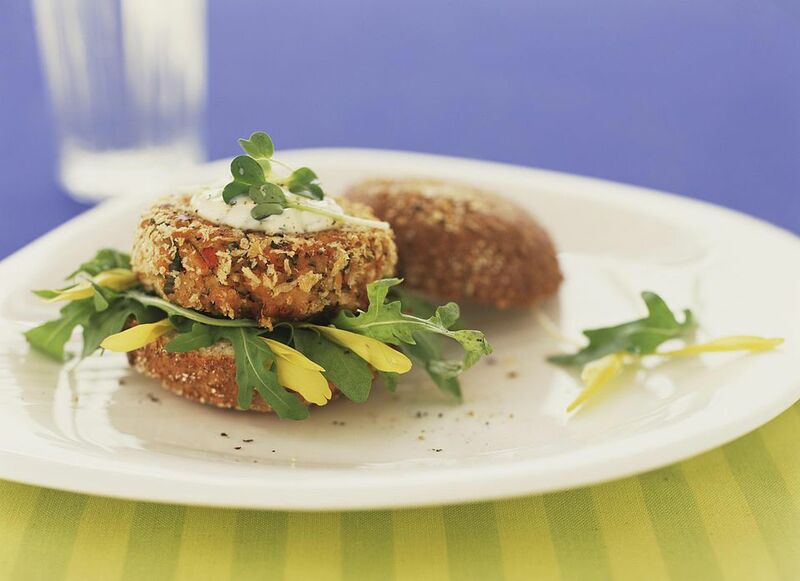 Salmon burgers from canned salmon is an ultimate delight and made from all pantry staples. You can serve these salmon patties so many different ways. They can be elevated for a classy dinner with mashed potatoes and peas. It'll be the ultimate old-fashioned comfort food dinner. You can also make them into burgers, serve with slaw, or eat as is. This recipe is very easy to make, even for beginning cooks. Just follow the directions and you'll soon sit down to a savory and satisfying meal. There's something so wonderful about a simple recipe like this that was made a lot before the fancy food movement started. There's nothing wrong with using canned salmon and saltine crackers; in fact, if you are used to eating fancy restaurant fare, this recipe will come as a pleasant surprise. This is true old-fashioned comfort food and it's always nice to know you can make something so tasty from what you keep in your pantry. The canned red sockeye salmon is recommended. Canned pink salmon is cheaper, but the flavor and texture of the lighter salmon are just not as good. Drain the salmon and remove the bones and skin (or crush the bones and leave them in for more calcium), then flake, and proceed with the recipe. You can also use leftover salmon fillets or steaks if you have any on hand. Just flake the salmon with your fingers until it's fairly fine, then make the patties. This recipe can also be made with canned tuna. For other serving options, try them with tartar sauce or some mayonnaise mixed with honey mustard. Place them on toasted English muffins or ciabatta rolls with some mustard and mayonnaise for salmon burgers. If you have sliced avocado and red onions, add those too. Add a side of oven baked fries (or even potato chips) and you've got a tasty lunch or dinner. In a large bowl, place the salmon and cracker crumbs; set aside. In a heavy skillet over medium heat, cook onion and red bell pepper in 1 tablespoon of the olive oil until tender. Add the cooked vegetables to the salmon and cracker crumbs in a bowl and mix gently. Add dill weed, egg, and lemon juice and mix gently. Form the salmon mixture into four patties using your hands. At this point, you can cover the patties and refrigerate for a couple of hours before you finish cooking them. When you are ready to cook, add 1 tablespoon olive oil and a bit of butter to the same skillet and reheat over medium heat. Once the butter has melted, add the cold salmon patties to​ the skillet. Cook the patties for 3 to 4 minutes on each side until golden brown and hot. Serve immediately.